According to Kroeger and Clark’s sources, 22.1 percent of women in the United States have been abused in a relationship. That number is large enough to include at least a small percentage of women who attend church regularly. In their 13-chapter book, the authors explain how men rationalize and justify abuse, and how often churches have sided with men. They point out on page 43 that “evangelicals feel very passionate about the family and speak warmly and enthusiastically about the importance of ‘family values.’” The longevity of a marriage may seem of greater importance than the health of its members. The main thrust of their message is love, and expressing the heart of God through relationships. “When we love people, we too will weep for them,” they say on page 53. This attitude is important, because when an abused woman cannot turn to her church for support, she can feel that her life is next to worthless. The authors handle abuse with respect and sensitivity, while bringing up the lack of support in churches in a straightforward way. On page 68, one victim said her congregation is “not a safe place to come . . . because nobody knows what to do with you.” Women like these are brave enough to remind us that “keeping the family together is not the highest goal of the Christian faith” (page 100). Kroeger and Clark challenge spiritual shepherds to acknowledge that violence in families is a problem and then offer help and healing for victims. 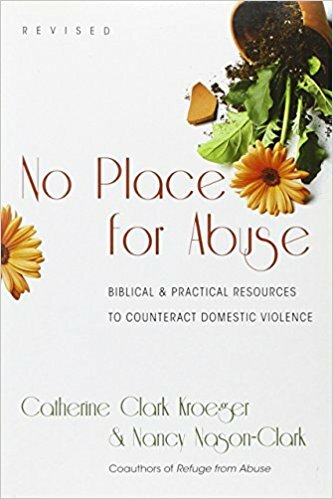 Kroeger and Clark include checklists of healthy and unhealthy ways churches may respond to physical or emotional abuse in families. In Chapter 5, “Searching the Scriptures,” the authors provide scriptural references that condemn patterns of abuse, stalking and harassment, abusive speech and more. The authors also include references showing how God responds to violence against women and children. I especially appreciated their view of communion in marriage and the interaction between men and women. In Chapter 6, “Man and Woman,” they say, “A wife who is considered less than her husband cannot bring her full self to the marital union, nor can the husband know the joy of full communion” (page 87). Their emphasis was on each person’s dignity and the growth of trust rather than gender roles. Yielding to God was their main concern.